Education is the key to helping a community become an informed, effective force in solving the Watershed's problems. A major goal of TEP's Education Program is to provide opportunities for students, residents, visitors and policy makers to understand the impact of their activities on the natural resources around them. We accomplish this through a myriad of programs. Some are designed to make people think; some are designed for participants to get their hands dirty or their feet wet through recreation; and some use fun activities to disguise the learning that is actually taking place. 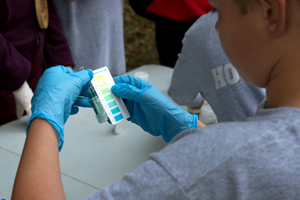 K-5: Our landmark events are the Children's Clean Water Festival and Down By the Riverside which provide over 600 elementary school students with hands-on outdoor educational experiences each year. TEP also has several environmental educational kits which can be check out - perfect for traditional classroom settings, home schools, scouts, and after school projrams. 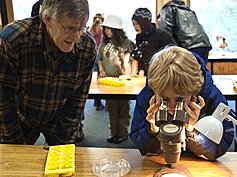 Our events and activities introduce children to the Wonders of Watersheds (WoW!) and empower them to become young environmental stewards. Education through Recreation: TEP co-hosts a series of guided hikes, walks, and paddles for the general public through our Explore Nature program. Join us on weekends, March - December, to experience the unique features of Tillamook County. For the independent adventurers, TEP has published Water Trail Guides to encourage paddlesrs to discover and enjoy of the scenic waters between the forests and the oceans. Community Awareness: TEP participates in numerous community events. Look for our exhibits during the Tillamook County Fair, Garibaldi Days, and local weekend Farmers' Markets. Now in its 17th year, the Children's Clean Water Festival is a day of outdoor learning for Tillamook 4th graders. Upon arriving at Twin Rocks Camp, each class is greeted by a volunteer guide who leads them through a series of presentations and exhibits about water. While one class goes on an Incredible Journey, "becoming" individual water droplets who travel through a complex life cycle, another group may take a walk to a nearby wetland where they will get personal with aquatic insects and plants. Other students learn firsthand how the environment adversely affects wildlife. More presentations open students' eyes to the fascinating web of life in a mud flat, or give them a chance to giggle as they watch a classmate be transformed into a water bird with lots of silly props that illustrate avian adaptations. This day, rich in hands-on learning, doesn't stand alone. During the months prior to the festival, the Festival Coordinator visits each classroom preparing the 4th graders for the day in the field. 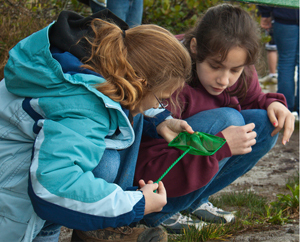 The Children's Clean Water Festival program supplements the Oregon Science Standards. Since 2002, Down by the Creekside introduces every county third grader, from all public and private schools, to a series of "hands -on" natural resources education activities in the field. Students spend a day rotating through sessions covering topics such as aquatic critters (Build-a-Bug), native and invasive plant identification (Plant Bingo and Riparian Art), habitat usage (Migration Headache and Skullduggery), and environmental stewardship (Chips-n-Dips). 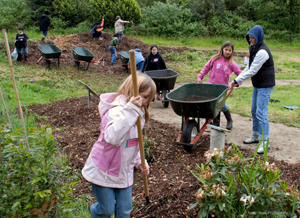 This year, students will gather at Kilchis Point Reserve to gain a sense of place about environment in which they live. Down by the Creekside compliments the Oregon Science Standards and is funded through EPA 320 funds. TEP is thankful for the past support from 40+ volunteers and over 15 partnering organizations. TEP has environmental education kits that K-5 educators and activity leaders can borrow for up to two weeks. Each kit supports a group classroom or outdoor activity, with materials and a lesson plan structured to enrich estuary literacy.